I just spent 15 blissful days on a Hawaiian cruise. 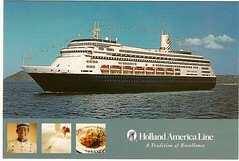 I chose this particular cruise because it was hosted by Abraham-Hicks my favorite Law of Attraction teachers. Abraham-Hicks is a hyphenated name because it represents two different partners. One partner is Esther Hicks (and Jerry Hicks her husband). Esther is a very sweet Texan woman (originally from Utah I believe), who is a ‘channel’. This means that she is able to use her senses to pick up and receive information from a non-physical intelligence. The non- physical intelligence is ‘Abraham’, a group of teachers who form the other side of this very unique partnership – which has been in existence for the last 20 years or so. People go to Abraham-Hicks workshops in order to ask Abraham questions – about anything they want to ask questions about. The topics range from deep metaphysical questions about life, the universe, the nature of time, etc to more humane issues about relationships, parenting, finances, health etc. Their answers explain how The Law of Attraction plays out in all of our lives. As a coach and facilitator, I have been drawn to this work for about five years now, and am most interested in how the manifestation process actually works. What the secrets are to defining and getting what you really want. And what the overall Big Picture is to our lives and process. I didn’t go up and ask Abraham a question myself. Instead I wrote out a list of questions in my notebook each day – and lo’ and behold my questions were answered through the answers that were given to others. Amazingly so. Below are some of the key concepts and statements that really resonated with me. We Are Much More Than Our Physical Selves: Abraham is a channeled source. That turns off a lot of people. I myself have been reluctant to talk about that too – just advising people to ignore the channeling if it bugs them and to focus on the information (which a lot of current LOA teachers do). However, Abraham advises that we don’t do this. That we come clean about it being channeled and get ok with that. Because it reflects a deeper part of their teachings. That we are ALL so much more than our physical selves. That our physical self is only a small part of what we fully are. There is much more to our world, to the system that we exist in. That the resources that we can tap into are truly remarkable. We aren’t just bodies banging about. We Each Are Playing a Unique Part in Evolution: Many people are concerned with finding their ‘Purpose’. In Abe speak our purpose is just being who we are and naturally going with the flow of our life. Our purpose is to use our natural powers of focus to create. Each of us is a unique being and as such a unique creator. Through your focus you create – thought forms and physical forms. As such you are uniquely contributing to the larger whole of evolution. Nobody in the history of the world has been you. Nobody else creates exactly like you. You are on the leading edge of creation – taking thought and experience where it has never gone before. You are playing your part in evolution by just being you. You are an integral part of the whole and you really can’t get it wrong. It Is an Ongoing Eternal Process – We Never Get It Done: Since we are larger non-physical beings really, there is much, much more to our existence than this one life. Abraham says that we never get it done. And that is a good thing. Kind of takes the pressure off of having to accomplish something or get ‘er done. Evolution is an eternal process. So after death, there is more that happens – more unfolding and contribution that occurs. Nothing to worry about. Nothing to really do. Just go with the natural flow, it’ll take care of it all. It will attract what is next to come. It’s All About Vibrational Tone: I’ve written about it before. The biggest thing with Law of Attraction is ‘vibration’. Everything carries a vibration or tone – thoughts and things. And like attracts like. Tones match up. Everything in your life is because you are a vibrational match to it. Given what is in your life what overall tone are you emitting? What tone do you have on certain subjects? What do you want to be a match to? Our Work Is to Shift Our Tone: Want to shift something in your life? Then your work is to shift your tone. To change your vibration around the ‘it’ that you want to shift – to become a vibrational match to that which you desire. There are many ways to shift your tone. Most involve using your powers of focus and imagination to focus on what does feel good and to envision that more and more. To think and speak about what you do want (again, not what you don’t – which unfortunately is pretty much a culturally sanctioned way of being). In the Hick’s best selling book, Ask and It Is Given, the whole second half of the book is dedicated to Abraham-inspired ‘processes’. Wonderful exercises that help you shift your tone – often step-by-step up the emotional scale. You can start with whatever emotion you are currently feeling. It is totally fine to be where you are. It is not about Pollyanna or ‘positive’ thinking stuff –really! I use these exercises myself and in my client work. They are wonderful. Go With What Feels Good: Ok, I realize that some of this is a little bit ‘out there’. I am taking a bit of a risk in writing about these concepts so directly. I know I will turn some people on this list off. But that is ok. It’s just not your thing. Just not your tone. That is totally great. Go with what feels good to you. It has taken me a number of years to get used to the Law of Attraction concepts myself, so I can relate to that. I’m just happy to have found something that feels really good to me. There are lots of paths, processes and tools. Just go with whatever resonates and feels good for you. That is what I do. And that is what I also advise my clients to do. You and your feelings are your own best guidance system. Follow that unique-to-you wisdom. Christina Merkley, “The SHIFT-IT Coach” is creator of the SHIFT-IT Graphic Coaching Process. To learn more about SHIFT-IT, Graphic Coaching and Personal Visioning and Planning, visit www.shift-it-coach.com. Note: Christina publishes The SHIFT-IT e-Zine the first Friday of every month. To view previous issues, see Ezine Archives. ?